The holiday season sure gives us a lot to smile about — more time with family and friends, traditions that only happen once a year, and presents to unwrap. The one thing we might not smile about over the holiday season is our dental health. Indeed, with the holidays comes an onslaught of sugar, starch, and alcohol — all of these factors can be Scrooges when it comes to your family’s dental routine. You don’t want to let the ghost of Christmas past come back to haunt your family’s oral health. 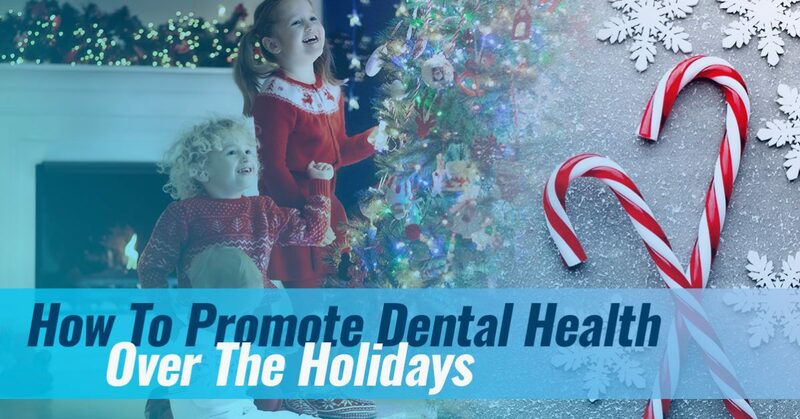 As the holidays ramp up this year, it’s important to be proactive with oral health. Especially if you have children, instilling in them the importance of oral health during holidays can help them for years to come. First Hill Dental Center is a local Seattle dentist office passionate about oral health and education. Our mission is to have a compelling impact on the lives we touch — and that involves teaching oral health routines that our patients can follow. Check out these tips for keeping smiles healthy during the holiday season. To get a dental cleaning before or after this sugary season, contact our local dentist office today! This is perhaps the hardest piece of advice to follow, but it’s arguably the most important during this time of year. Time off from school and work generally means staying up later, going to parties, and falling out of a normal routine. We exercise less, sleep less, and take care of ourselves less. If you and the kids are up reading The Polar Express or decide to attend midnight mass on Christmas Eve, make sure you still brush your teeth at the normal time. If you have hot chocolate or treats, brush your teeth again. This is an especially important habit to teach kids — you’re not only sticking to a normal oral health routine, but you’re also compensating for after-hours food intake. Snacking on treats throughout the day is arguably the worst thing you can do for your oral health. When we snack throughout the day, we expose our teeth and gums to harmful sugar and don’t give them a chance to eliminate the residue. If you’re going to eat sugar or dessert, it’s far better to eat it in a single sitting after dinner. The rationale behind this involves the levels of saliva we produce as we eat. After a big meal, our bodies produce more saliva which in turn breaks down harmful sugar particles. We’re also more likely to drink water with meals, and water is crucial to helping the mouth break down sugar. After dinner and dessert, try to brush your teeth immediately. This way, you expose your teeth to less sugar and are less likely to keep snacking throughout the night. Between school and home, kids get candy as a reward far too often. Rather than offering sugary treats as rewards for good behavior, good grades, etc., it’s better to think of alternate rewards. Think about having a prize drawer (like the ones at most pediatric dental offices!) that your kids can reach into after a job well done. Stock it with mini toys, puzzles, bouncy balls, and other trinkets that don’t involve sugar. The same goes for stocking stuffers. While we’d never suggest coal, we also would try to steer away from too many candy canes or candies that involve sucking. The longer a candy is in the mouth, the more damage it’s likely to do for oral health. When the kids are off school and you’re off work, it’s a great time to visit the local dentist. Appointments around this time of year tend to fill up fast for this very reason, so make sure to schedule with your local dentist in advance. Getting your teeth cleaned and your oral health examined around this time of year is a great preventative strategy. Your teeth will be cleaned and your dentist can remind you of healthy holiday eating tips. This tip is important every time of year, but it’s essential during the holiday season. Water, especially fluoridated water, strengthens enamel and gives our teeth a line of defense against cavity-causing sugar. With meals, water is also useful at eliminating food particles and encouraging our mouths to produce more saliva. For adults, drinking water is handy especially if you’re consuming more alcohol than normal. Try to alternate every alcoholic drink with water. As a Seattle dentist office, First Hill Dental Center offers cleanings, emergency dental work, fillings, and much more. Our team also specializes in pediatric dentistry, so you can schedule appointments for the whole family. For a dentist in Seattle, contact First Hill Dental Center today!